Pig and Paint: Doggie Edition: Cooking for my Boxer? 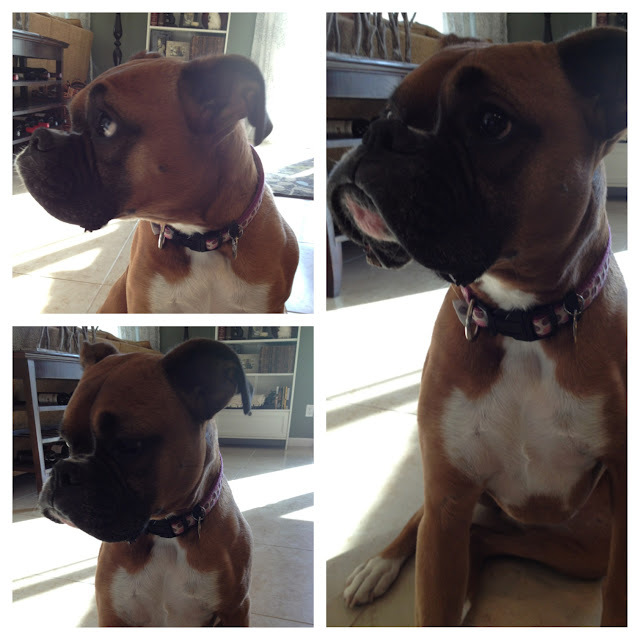 Doggie Edition: Cooking for my Boxer? I love my dog. I’m sure that’s no shocker to those of you who follow this blog. I’ll be honest, though….Brian and I never gave much thought to her diet. We always figured “dogs eat dog food” and that was that. Anyone else with me on that? We’re Costco junkies, and buy everything possible there, including Aybee’s food. She currently dines twice a day on a cup and a half of Kirland Signature Lamb and Rice dry food (her preference), mixed together with a third of a can of Pedigree wet food. Occasionally, I’ve tossed a scrambled egg in with her food, but those moments were rare. She makes significant quantities of poop. This is my little poop machine. Ain’t she a cutie? I was recently introduced to a site called Homemade dog food and boy were my eyes opened! I learned a lot about the benefits of homemade dog food, and I’m embarrassed to say that some of the things I learned should have been obvious to me. For example, dogs are carnivores. Their digestive tracts are designed to handle meat – not veggies or carbs. Seems obvious, right? But how many of us have ever applied that to our poochie’s diet? Not me. Suddenly the massive amounts of turd and obnoxious farts make sense. Which leads me to the next thing I learned: if your dog is producing turd in equal measure to the amount of food said dog is consuming, that is a problem. The fillers in most commercial dog foods are not ideally suited for doggy digestion, and therefore come right out the other end! Aybee is an excellent example of this. If poop was energy, she could power an entire city block! And that's barely scracthing the surface of the benefits of homemade dog food. I encourage all of you who are dog owners to research Homemade dog food for yourself. I am so glad I did! This web site couldn’t have come into my life at a better time, because we were just getting ready to stock up on dog food. Instead, I’m going to give Homemade Dog Food's Easy cooked dog food recipe a try. It looks so simple and easy to make, and price-wise seems to be on par with what I spend on Pedigree wet food alone. And, since I made Aybee promise me that she would live forever and be my dog for the rest of my life, the least I can do is set her up for success! Have any of you tried homemade dog food for your pooch? Fascinating! I will have to check this out. We've recently found out our dog has some food allergies. Thanks for the link!